As more language teachers discuss ditching the textbook, the open education community is discussing another way to address outdated, incomplete, and impersonal books: student authored textbooks. When a teacher asks their students to write their own textbook, the teacher is a guide for actively learning and collaborating students, rather than a transmitter of knowledge to passive students. There are some great examples of instructors who have already tried this described briefly below. 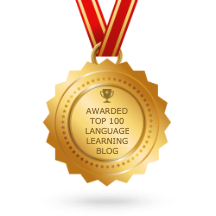 They are all from higher ed, and not all are language related… but please read on, there may be some ideas here you could use! Most student authored textbook projects begin with a simple platform, such as Pressbooks (which is WordPress-based), or a wiki of some kind. A class may adapt a book or create a whole new one. For example, Robin DeRosa from Plymouth State University created an Open Anthology of Earlier American Literature with her students, based off of an existing anthology students were paying money for, even though most of the literary readings were in the public domain. David Wiley took the openly licensed textbook Project Management From Simple to Complex, and his students adapted it into a book about project management for their field: Project Management for Instructional Designers. Dr. Lixun Wang’s class created a linguistics textbook from scratch. Creating a textbook is not only collaborative and creative; it can also be a lesson in digital citizenship. As Jennifer Kidd, Patrick O’Shea, and Peter Baker wrote in the Chronicle of Higher Education, such vast amounts of knowledge are available on the internet that students now have a greater capacity to find up-to-date information, and writing textbooks helps them assess the usefulness and reliability of this information. Drs. Wiley, Wang, and DeRosa all report that their students were more engaged when they had the responsibility of creating their own text and taking charge of their own learning. Dr. Wang points out that students leave class after creating a textbook as more autonomous lifelong learners, because they are more aware of the teaching and learning process. Based on these examples, which address different students and different disciplines, how would a language teacher go about creating a textbook with their students? What would the result look like? Is this an opportunity to provide communicative language teaching in a way that mainstream textbooks don’t always do? Is this only possible in higher ed, or could K-12 students do it too, if not to teach the language itself, perhaps to teach culture or literature? Please respond in the comments below! By the way, all of COERLL’s materials have open licenses, and most of the licenses allow users to make modifications to the content, so if you ever use Français interactif, Brazilpod, SpinTX, or any of our other materials in your class, they could be the basis for a new student authored textbook! David Wesch on his students’ collaborative research paper.